The store is located in Via Larga street, corner of Piazza Santo Stefano 5, in the heart of a prestigious area of the city that houses the sales points of some of the most renowned high-end design brand. The whole exhibition space of more than 200 square metres has been set up by Nicola Gallizia and co-designed with Alessandro Ruga. 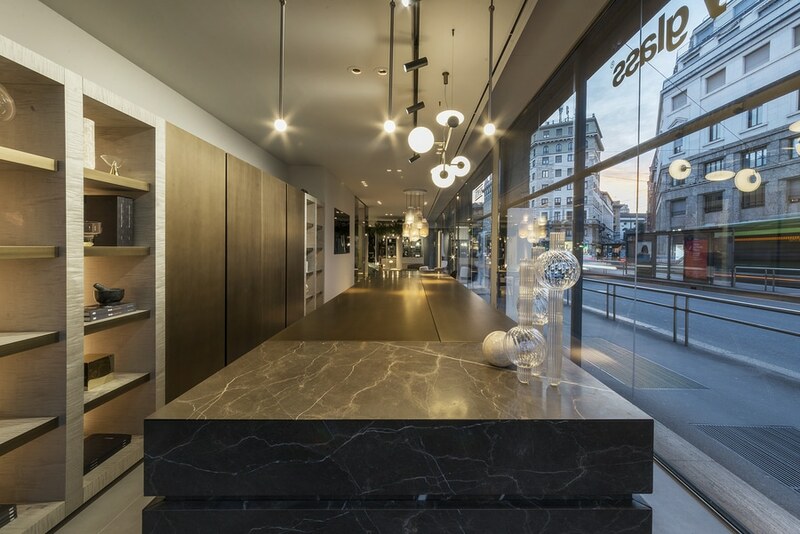 It will be run by Mauri&Mauri, a commercial partner of the best Italian design companies. 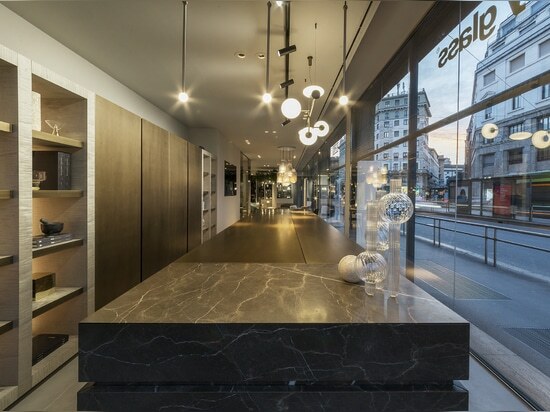 The store named Via Larga 3, besides TM Italia, hosts other three companies belonging to the furnishing sector: Henry Glass (glass doors and high quality systems for architecture and Interior Design), Kristalia (modern design furniture), Penta (lighting systems for domestic and public environments). Wide windows facing the street light up the environment where the products become real protagonists with their design and materials. Different stories that interweave with elegance and harmony. The essential architecture of the space plays with neutral light gray tones of the floors and walls interacting with the preciousness of the materials, both of the finishes and the products. 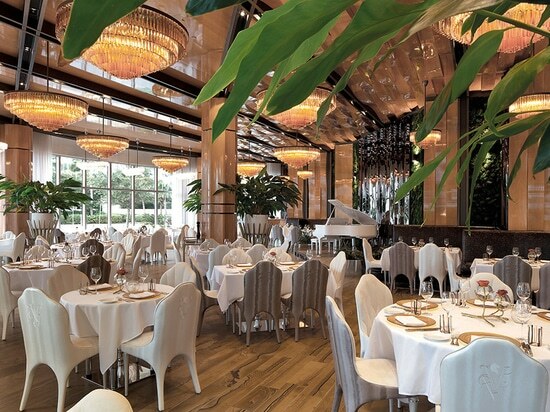 The large onyx-effect ceramic paneling with shades flowing from gray-blue to light browns, together with the doors finishes, a filter between the different areas, make the spaces refined and bright. 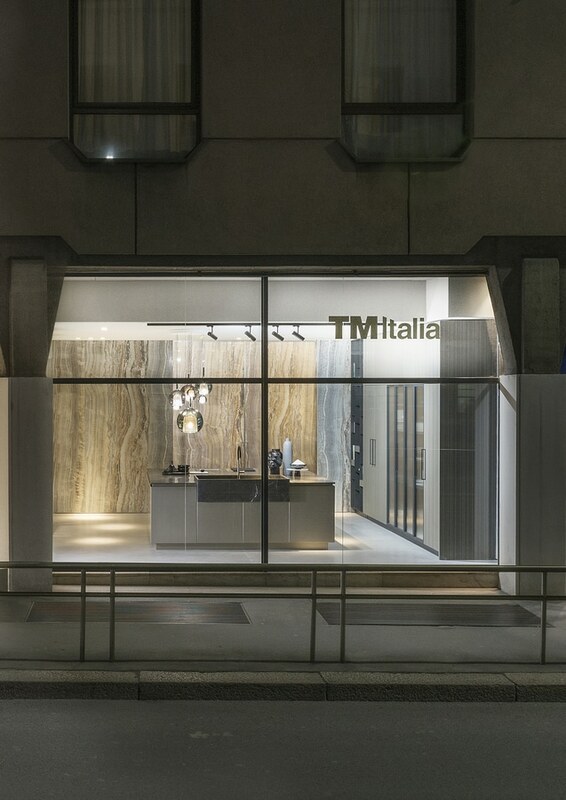 TM Italia kitchens Neolite – design ruadelpapavero, Rua – design ruadelpapavero and T45 – design TM Italia R&D, are positioned on the left and the right side of the entrance. 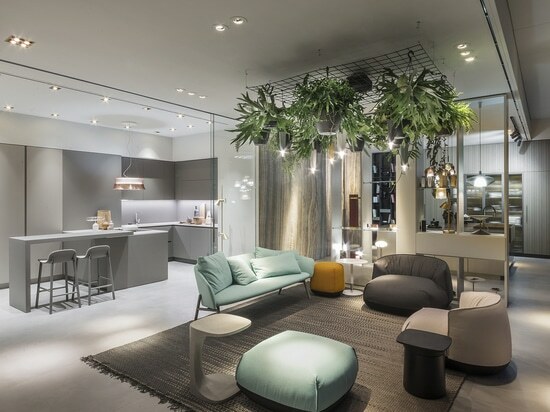 The K6 kitchen – an articulated composition designed by Alessandro Ruga, is instead positioned at the far end of the store, in the area dedicated to show cooking. 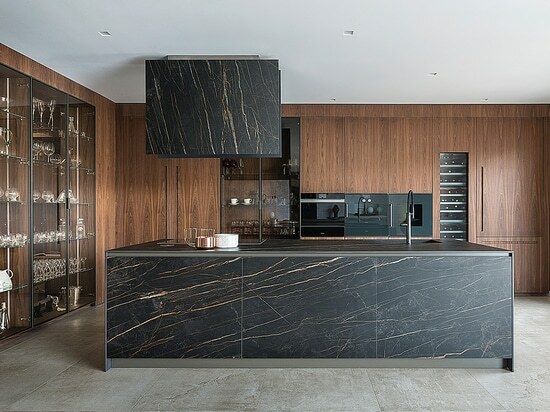 The Neolite kitchen with island is characterized by the harmonious coexistence of precious materials with diverse textures: antique bronze finish of the doors, natural “Brown Gold” stone of the island, sycamore veneer of the structures and the open compartments. Just like precious treasure chests cured in the smallest details. 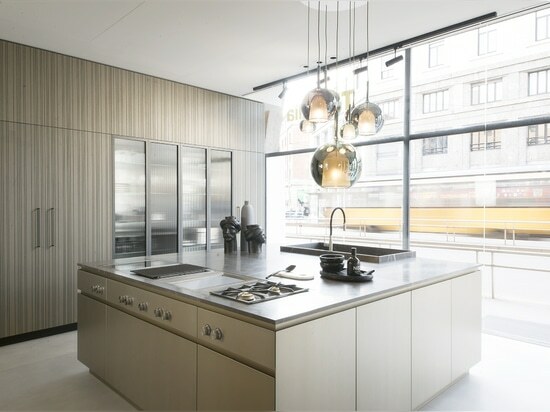 The combination of Rua columns with T45 island proposes a sophisticated reinterpretation of large lofts by using natural materials and unique details: column doors in oak veneer on black-colored core and refined Scannellato belga crystal glass, island with metallic champagne lacquered finish and “Pietra di Corinto brullato” marble worktop with an assembled sink – a work of skilled craftsmen. 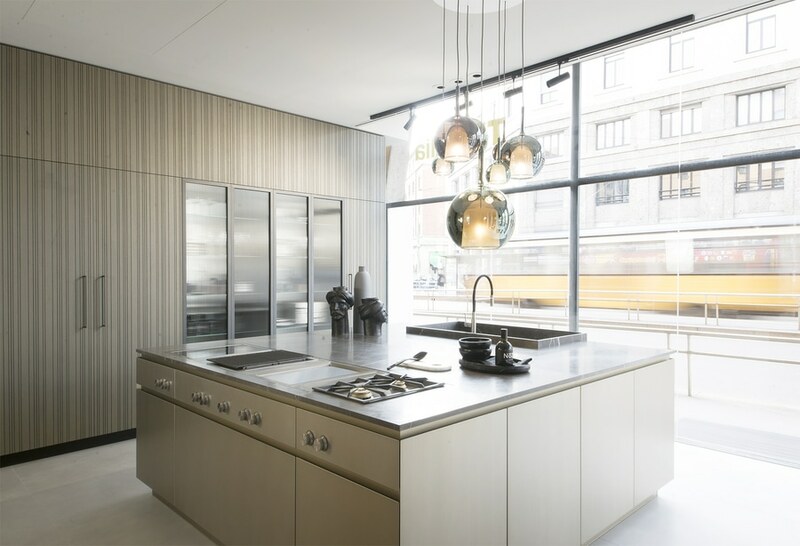 The K6 kitchen positioned in the show cooking area boasts a refined chromatic mix of beige and warm-to-cold grey shades with a modern and functional look. 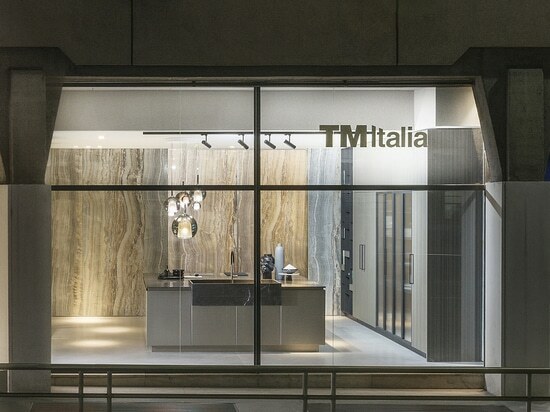 The harmonious heterogeneity of the products thoughtfully represents the essence of TM Italia, a multi-faceted and transversal company capable of producing unique pieces while remaining true to its vision of quality and style. The concepts, shared by the four partners, which enclose the meaning of this business and commercial project are focused on: internationality, high positioning, similar business strategies, culture of projects tailored for the clients, maintaining at the same time the respect of the identity of each of the four brands thanks to dedicated and customized exhibition areas. The space immediately to the right of the entrance is designed to act as a temporary stage where the set-up will change according to the season, commercial needs or current trends. 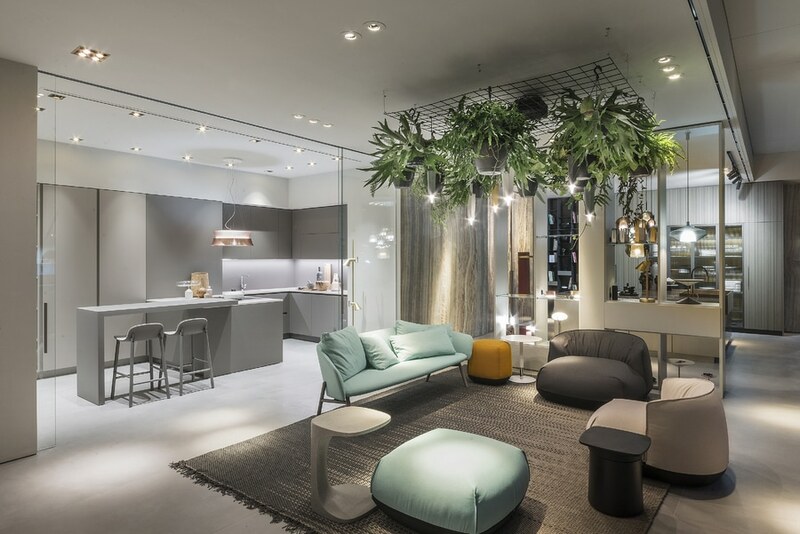 In addition to an area for private meetings with customers and architects, a shared “materials’ library” has been thought to house the wide range of samples of all the partner brands.